After I had posted that render, the next morning I woke up and I noticed an incredible spike on this blog visitors' count. On a good day, I get somewhere between 50 and 150 visitors. At 8AM yesterday it was at 400 already. I checked the source of the traffic, and I discovered it was coming from BlenderNation, a Blender News web site. 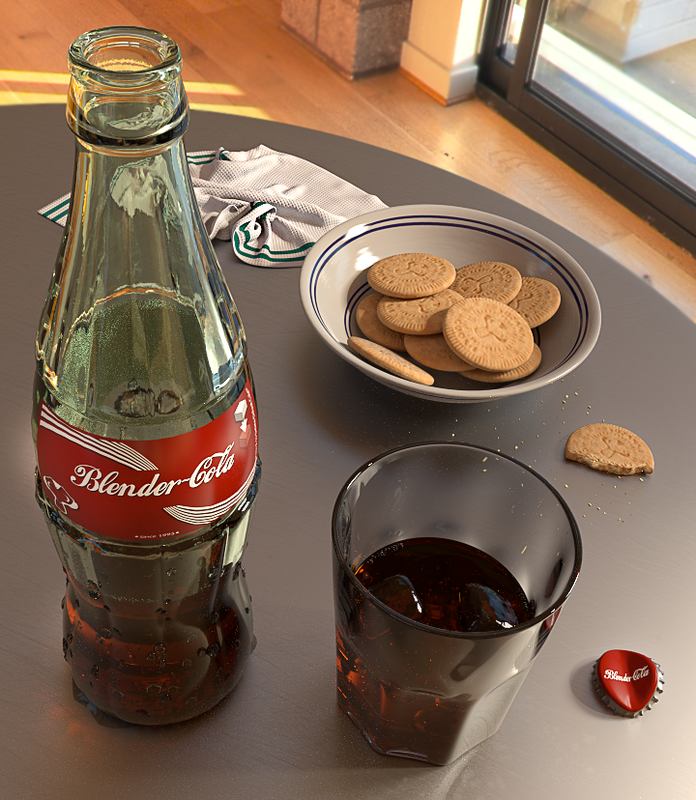 Apparently, this BlenderNation admin, Bart, liked my Coke and Cookies render, and put it up on their site. On top of that, blender.org, who usually mirror BlenderNation's news and posts, linked to that post as well. This incredible, two-pronged combination did the trick, I ended the day hitting the 2500 mark. I'm not complaining, I love the attention, and I like talking to people about Blender and Cycles and anything else 3D. Everything 3D. Another interesting thing about what happened with my being featured in another site is that, all of a sudden, my artwork had become. It got away from me, and it started having an independent life all of its own. It got out into the world, and that was that. It's a funny feeling, but also a good feeling, and a wake-up call concerning the obsessive pursue of perfection. You want your work to be perfect, but in order to achieve it, you keep tweaking and futzing and fidgeting with things, but it does not necessarily get any better. It's just that you get all caught up in the creative process. Or maybe you're just an addict :) Sometimes it is better to leave the freshness of the first impulse as is and not worry about the imperfections. Some examples related to this idea come to mind: the Aeneid is not a finished poem, someone refused to burn it as Virgil demanded on his deathbed. One more: Paul Valéry's Le cimitière marin was published before he could 'finish it.' His over-eager publisher friend took it away from him and decided it was good enough. The hutzpah! Anyway, for all these reasons, I wanna send a big thanks to BlenderNation, blender.org, and all the visitors to my blog. THANKS! Oh, and here is the really-final render! I could not resist changing a few things around ;) If you liked the former version better, you know where to go :) Just click on final. Also, I've decided to release the coke model as open-source file. It seems like there are many others trying to create soda bottles, so perhaps it can be helpful. Send me an email and I'll send you the file, minus the textures. post-processing work done in Photoshop.